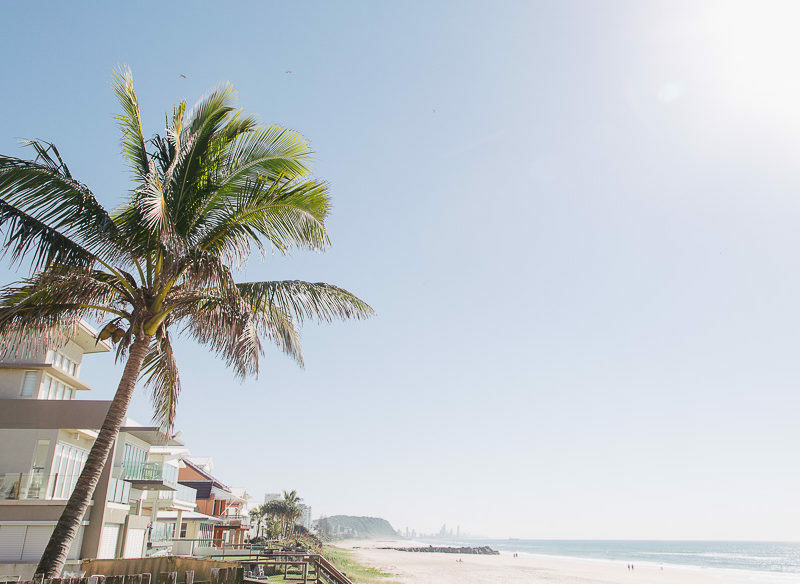 Palm Beach, a suburb on the Gold Coast, has a new sparkle since being gentrified in the past few years (photo: Krista Eppelstun). Palm Beach (Gold Coast) has roots as a 1960s holiday home dream and a somewhat shady rep, but it’s now having its time in the sun with new developments and an emerging dining scene, writes Celeste Mitchell. There was a time when you would have had absolutely no reason to stop as you drove through Palm Beach. 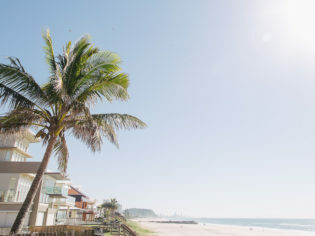 Sitting like the forgotten middle child between Coolangatta – on the Gold Coast’s southern border with New South Wales – and its hip older sister, Burleigh Heads to its north, Palm Beach was at one time known more for its needle exchange site than a buzzing cafe scene. Straddling both sides of the Gold Coast highway with a numbered system of street names that’s more Santa Monica than Queensland, ‘Palmy’, as it’s affectionately known, was always a bit rough around the edges, even in the 1870s when the area was designated pastoral land. The South Coast railway didn’t even stop there until 1922, when it was still part of Elanora. A subdivision by the Palm Beach Company Ltd was what led to the beachside ’hood gaining its own name and subsequently, fibro holiday homes started sprouting along Jefferson Lane. It was the affordable dream – in the early ’60s The Truth newspaper in Brisbane advertised ‘holiday homes for the working man’ with blocks of land up for sale, with ‘whatever deposit suits you’. But within the last few years, this suburb has been gentrified quicker than you can say “Range Rover” and a new wave of discerning young residents has washed in. New luxury apartment developments are taking over corner blocks and real estate prices are skyrocketing. “When my friends heard I was moving to Palm Beach they were like, ‘oh no, it’s dangerous, there are gangs, you can’t move there,’” manager Ludmila Achurch says as she sets down our meals at The Blue Door on 5th, a new restaurant fastidious about organic, local produce. “But it feels like a village, you know… I love it,” she finishes. That’s what’s led to a spate of openings within the past 12 months, so many, in fact, that you’ll be hard pressed to fit everything into a weekend. Start with these local haunts and see how you go. Is it a cafe serving cocktails or a bar serving breakfast? It’s both! Local tradies Josh Bailey and Andy Canfield decided to rip out the adjoining office space that came with the lease on what was once Little St Kilda Cafe and lifted the roof to drink in one of Palmy’s best assets: its ocean view. Now running as a cafe downstairs serving healthy eats and smoothies, it’s the rooftop that steals the show, opening for weekend brunch and Sunday sessions, with a sneaky little laneway linking the two. Local ales are on tap, and there are house cocktails and Ink Gin from nearby Husk Distillers too. Breakfast spots like Mr Bengel bring a healthy, hipster vibe to the beachside neighbourhood (photo: Krista Eppelstun). With a pedigree built in Burleigh Heads (with popular restaurant and rooftop bar, Justin Lane, and Harry’s Steak Bistro & Bar) the guys behind Mr Bengel have injected a very GC vibe into this Gold Coast Highway spot. You’ll find rainbow and green breakfast bowls brimming with kimchi and sauerkraut, and loaded with avocado, greens, smoked salmon and free-range eggs. A green breakfast at Mr. Bengel (photo: Krista Eppelstun). New boutique Little Maisy’s features all Australia brands and designers (photo: Krista Eppelstun). What exactly is an Instagram store? That’s the question asked most in the adorable new kids’ boutique, Little Maisy. Stocking over 45 ‘Instagram brands’ – all handmade and Australian-owned products, previously only available via Instagram – expect trendy silicone teething chews in the shape of pineapples and teepee tents, Rubz & Lolli leather shoes and hashtag slogan tees. The Craft Parlour hosts 15 workshops a month for people to come and get creative (photo: Krista Eppelstun). “I’m not into up-and-coming places, everything I’ve done is organic,” says Rachael Valentine, the girl behind the cutest house in Palm Beach, filled to the brim with plants, crafty creations and op-shop finds. There’s no denying she was ahead of the game, though. After organising workshops at Miami Marketta, Rachael chose Palm Beach to bring The Craft Parlour to life permanently and now holds 15 workshops a month in everything from macrame and resin art to meditation. Street food and food trucks fused into one restaurant (photo: Krista Eppelstun). The Collective takes the concept of street food markets and food trucks and amps them up with table service and one menu that allows you to choose from five kitchens. Offering everything from poke to pizzas, tacos to baos, and chicken ‘n’ waffles to jugs of Pimm’s, this two-level space heaves on weekends; arrive early if you’re in a group. La Costa Motel will take you back to the time of ’50s motels (photo: Krista Eppelstun). While there are no hotels in Palmy (yet) and you’re more likely to rent a place on Airbnb, 10 minutes down the highway you can take a step back in time in one of the original ’50s motels at La Costa. Rooms are simple but sufficient, and let’s face it, it’s all about the location – just a few short steps to the beach – and the cute beach umbrellas and cruiser bikes out front of the weatherboard digs. Start your day at the bar and check out the motorcycle workshop inside this cafe on the Gold Coast Highway; the owners flew in a mechanic all the way from Italy to tinker with the tools inside the uncharacteristically clean glass-enclosed space. An industrial theme permeates, while the all-day menu – affixed to Espresso Moto numberplates – is more hipster biker fuel than grease monkey, with dishes like ACai Bircher Muesli with house-made lemon curd. Relax and unwind at the Greenhouse, The Bathhouse (photo: Krista Eppelstun). Technically just over the ’burb border, it’s still fair to group Greenhouse, The Bathhouse as part of the Palmy crew. Leave your shoes at the door for a massage or facial using plant-based products, or stay for a full session rotating between the whirlpools, eucalyptus steam room, red cedar hot rock sauna, and magnesium plunge pool and sun deck, snacking on vegan eats in between. The Blue Door on 5th is full of fresh food and produce from Byron Bay and Stanthorpe (photo: Krista Eppelstun).